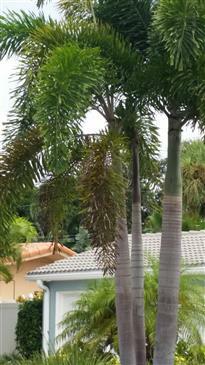 Below I wish to quickly introduce this desirable species, Wodyetia bifurcata, the Foxtail Palm. I'll show lots of photographs to demonstrate the trunk, silver crown shaft, medium height and leaves. Also, I'll give simple to read information so the reader knows about this species, its characteristics and the Foxtail's usage in the garden. 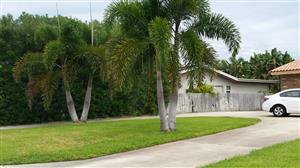 The common name for Wodyetia bifurcata is the Foxtail Palm. It got this name because of the very fluffy leaves of this species. They resemble the tail or a fox. 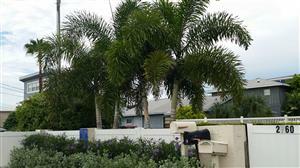 Native to the Queensland area of northern Australia, this thin trunk pinnate palm is attractive and never gets too tall. In our area a mature height under twenty-five feet could be expected. They can get taller in the tropics. It likes heat and full sun. Read below to learn about this rather recent introduction to plant nurseries around the world. The Foxtail Palm is native to the Cape Melville National Park in Queensland, Australia. This location is north of Cairns and Port Douglas. The locality is known for many botanical wonders. Surprisingly, the Foxtail Palm remained undiscovered until 1978 when an Aboriginal man brought this species to the attention of authorities. Palm specialists worldwide were totally unaware that it existed. A formal description of this species was published in 1983. News of this newly discovered palm circled the globe rapidly. I first heard of it in the early 1980's when an Australian brought some large seeds with him to show enthusiasts. 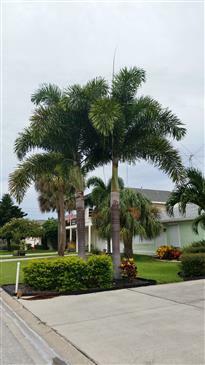 As pictures of this beautiful palm followed, there was immediate demand for such a pretty palm that would grow in many areas. And, soon there was a huge demand for seeds. Unfortunately, this demand exceeded supplies and in no time a "black market" developed to offer supplies of seeds. It was even rumored that the collection of Foxtail Palm seeds was more profitable than the local drug trade and thieves approached the coastal habitat on inflatable boats to poach seeds. There was even reports of an instance where a lazy thief actually cut down a tree just to harvest the large seeds. This promptly led to the Australian government protecting the species and placing a ban on exportation of the seeds. Fortunately domestic supplies of seeds from grown plants elsewhere have been adequate for demands since those early days. As mentioned above, this species is native to a national park north of the Cairns city in Queensland. This would be in the Melvin Range in the Cape York Peninsula. It lives in very sandy and gravely soil around boulders. This area has a prolonged dry season and experiences high heat. This is the only known location of this species and it is a monotypic species. There are no other species in this genus. Reportedly the soil in habitat is acidic. Natural stands can be found at elevations up to about one thousand feet. It gets very high heat and thrives there in full sun. Trees fruit during the Australian spring. The dry season lasts for about six months with heavy rainfall occurring from December through March of the year. 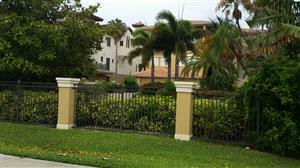 This is a thin trunked, crown shafted, medium height pinnate palm that is very attractive in appearance. Anticipate a mature height above twenty feet but almost always below thirty feet. Leaves are very plumose with leaflets coming off the leaf stem at all angles. Leaf color is green and the crown shaft is silver to green. Trunks may bulge slightly at their base and in their mid-section. Mature trees of the Foxtail hold about eight to ten leaves averaging a length of about six to nine feet. That have short bare petioles (leaf stems) and are without any armor or spines. Leaflets appear at any angle of the 360 degree cross section of the leaf. Leaflets are thin and about a foot long. They have chopped ends (premorse) that, on close inspection, are a bit ragged. But, with so many leaflets, the overall appearance is full and lush. Leaf color is green to dull green with no silver underside to the leaflets. The average width of the crown of leaves on a mature tree is ten to fifteen feet. 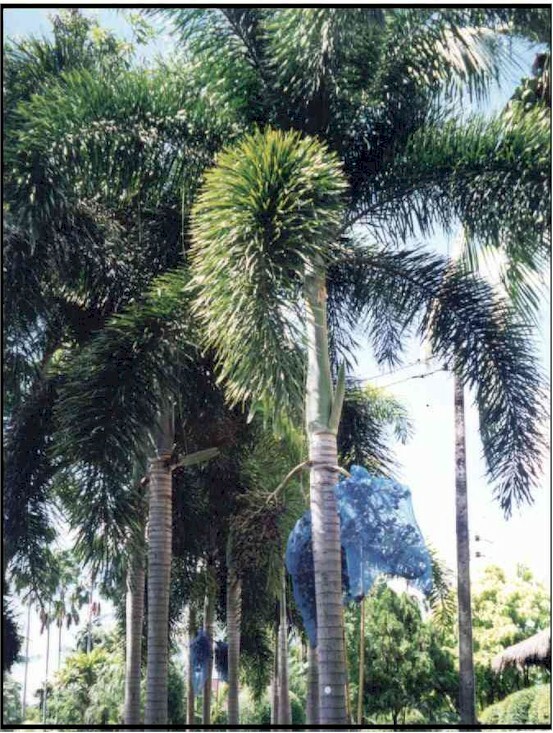 The trunk of this palm species has a crown shaft below the leaves as seen in the photos. This is a bare area that is smooth and actually formed by the wrapping and attaching leaf base of the bottom leaf just above the crown shaft. This structure wraps around the entire trunk. Enthusiasts find crown shafts to be quite attractive. There presence indicates that the palm is "self cleaning". This means that no actual pruning of old leaves is needed. Leaves fall off on their own as they age. The crown shaft also makes the trunk look quite "smooth", another popular trait. The crown shaft is silver or silver green in color. Trunk diameter varies with culture but averages eight to twelve inches, sometimes a bit more. It can bulge a bit in the central trunk and at the base. Growth rings are present but not too apparent. Blossoms appear just below the crown shaft. 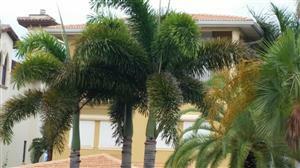 TheFoxtail palm in most localities wants full sun. They do very poorly in the shade and in most inside applications do not do well. The only exception to the full sun rule is in hot desert environments where they could possibly do best with part day sun. Many authorities say that Foxtails are only good down to a freeze. This is not true. 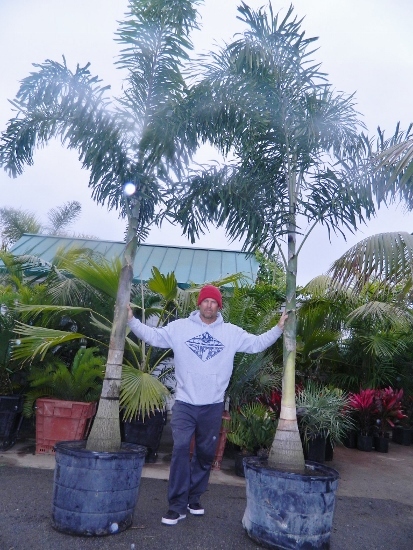 Wodyetias can take temperatures well into the mid-twenties F. and have an absolute tolerance of cold down to perhaps 22 degrees F. If one can grow a King Palm, most likely he can grow a Foxtail. Interestingly, Foxtails love heat. They easily take 100 degrees F. days. If you live in a desert area, consider less than full sun for growing. They'll tolerate the heat but your sun may be too much for one. 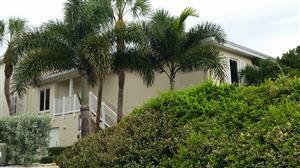 In hot and more tropical areas, growth is quick. In temperature regions growth rate is medium. But, remember that this is not a very tall mature tree. So, take this into consideration. From a small plant (i.e. seedling), growth in our area in fairly slow. They love heat and essentially stop growing without good summer heat. I'd estimate the water needs of this species are about average for a palm. But, because (in habitat) they do well with a long, dry season, there may be some potential for this to be a water conserving species. We've found that this species does poorly right on the ocean in Southern California. It's not that it won't grow, but rather that it suffers from continual brown tipping of the leaflets with a somewhat scrappy appearance. If one is inland a bit, this problem is much less. 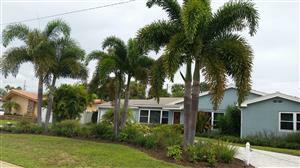 If one satisfies the growing requirements above for the Foxtail Palm, it is an exceptionally nice species for the garden. It can be used in a personal residence, in a commercial setting, as a species to line the parkway of a street or in an arboretum that has adequate sun. 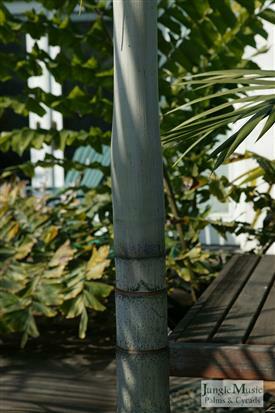 Plants are usually planted as a single palm. From time to time we will have a "multiple" specimen, but this is quite rare. Expect a mature height of about 25 feet and a trunk diameter of a foot or less. Most importantly, unless you are in the desert, guarantee that it presently and in the future will get full sun. It can also be used in a narrow planting strip as trunks are narrow and leaves are quickly overhead. This species does better in the ground than in a container. Some, however, do grow it as a patio plant. 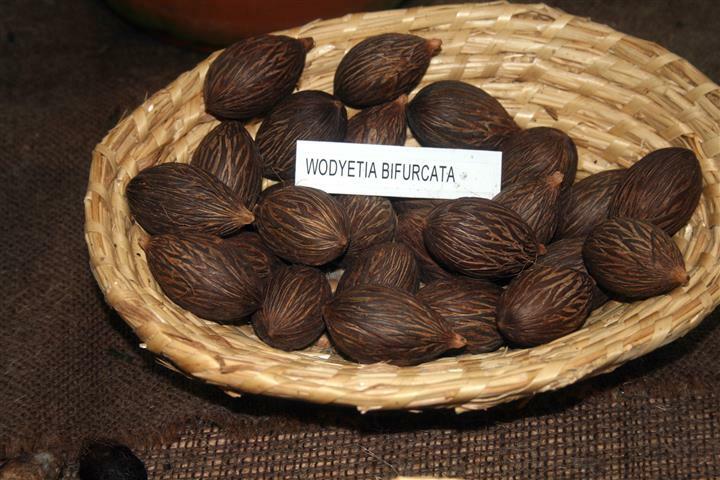 We usually have available a reasonable selection of various sizes of Wodyetia bifurcata. The photos below are representative over time. We typically offer 5g, 15g and 25g sizes. 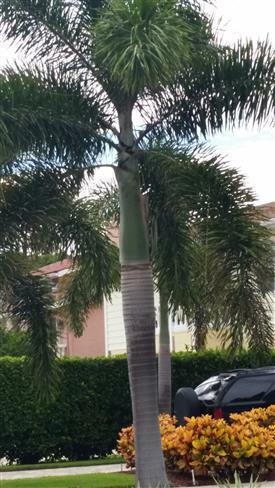 Wodyetia bifurcata, known as the Foxtail Palm, is a medium height, thin trunk palm that is self-cleaning and has a smooth crown shaft. Leaves are plumose (fluffy) and this species wants full sun in most areas and tolerates heat. Cold tolerance is, at best, into the low 20's and growth rate is medium. Small plants are slow to get started. It tolerates heat well. Mature height averages 25 feet. Enthusiasts like this species because it is not overly large and can fit into a small planting area.